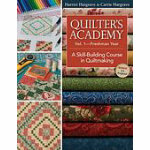 This must have course guides you step by step through the basics of quilt making, from setting up your sewing space to binding and finishing your first quilt. The 9 class room tested skill building lessons draw on bestselling author Harriet Hargrave's many years of teaching experience. Complete instructions are included for making 13 classic quilts.